The Whisky Virgin was not alone in experiencing International Scotch Day for the first time last month. The inaugural event, which took place on 10 February 2017, united Scotch whisky fans all over the world, and left a lasting impression on our impressionable newcomer – of all the right sorts. ’Sup bruv. Long time, no speak. Though, to be real, it doesn’t feel like that long at all. Anybody else blink and suddenly… boom! It’s March. Anyhow – I want to go back with you all to last month and a little something called International Scotch Day on 10 February. I hope all you Scotch whisky lovers had a blast. I was loving the community spirit shown for Scotch from across the world. Big up yourself Diageo for organising a top global celebration. A couple of days before, I’d received an invitation from these ballers to a beginner’s whisky tasting with the man, the myth, the legend, Mr Colin Dunn, Diageo whisky ambassador extraordinaire. His job is to spread the word about Diageo’s top drams, from brands I hadn’t even heard of until the tasting, such as Royal Lochnagar to ones I’m sure you’ve all come across, such as Dalwhinnie and Mortlach. Of course, I had to accept, so I donned my best kicks, boarded a train and headed to the swanky Connaught Hotel in London. I took my seat, a welcome cocktail in my hand (garnished with edible peat, who knew, fam?) and six whiskies laid out in front of me. Once everyone had arrived, Mr Dunn took his place front and centre, tap dancing his way across the room, one liners flying at us from all angles leaving us in stitches. He was buzzing; we all were. When it came to the tasting he really broke it down for us from start to finish. And we did. This, he explained, would warm up the whisky and release more aromas in the glass. So we took the lid off like he told us to, and slowly edged the glass towards our noses to take our first smell. Then it was time to taste. ‘Hold the whisky in your mouth for as long as you can,’ he was saying. ‘Try a second for every year it’s been aged. Then swallow.’ We listened to his every word, following instructions like our lives depended on it. And the longer we lasted, the more flavours we were able to pull from the whisky. As our hour came to an end – much too fast – we were handed a box. A white box with five miniature whiskies inside, like a starter kit for newcomers to whisky – people like me, innit. Now, in there you’ve got Bell’s blended Scotch; Talisker 10 Year Old single malt; Johnnie Walker Black Label and Red Label (both blends); and Haig Club single grain. 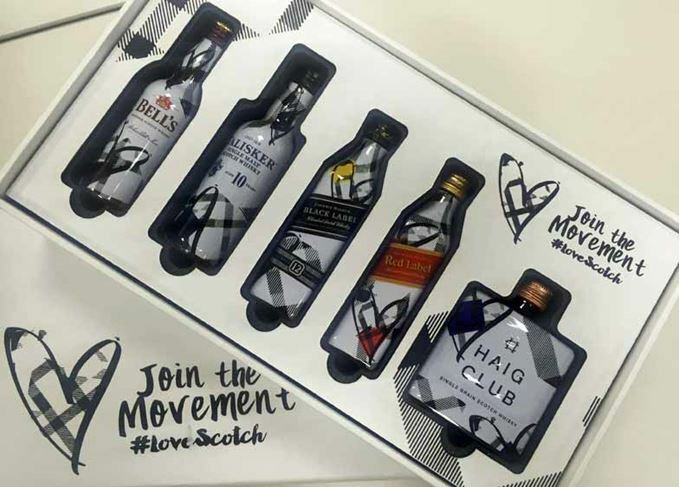 Five mini whiskies, dressed up in some bangin’ #LoveScotch tartan packaging and I’ve got to hand it to Diageo, this is a sound selection of samples for beginners. Like most people, Bell’s was a familiar brand name I heard while growing up. It’s not the most amazing whisky in the world, but it’s a good place to start – particularly mixed with a bit of soda water. Because hey, it’s your whisky, so drink it how you want to, do you know what I’m saying? The Johnnie Walkers: Red Label, no-age-statement and the world’s most popular whisky. And after tasting it, I can see why. The nose is all sweet and honey, then the palate brings through raisins, a little spice and a tiny bit of pepper. Not at all scary for first-time whisky drinkers. And Black Label? At 12 years old, this is a smooth operator of a whisky, let me tell you. It’s got gingerbread-like flavours, light spices and a toffee-like sweetness to balance. With your single grain Haig Club, this is pretty sweet on its own. Personally, I like to put it with ginger ale, chuck in some ice and add a slice of orange. Hit me again, bartender. Then there’s the single malt of the gang, Talisker. The smoky one. Now, if you read my top drams of 2016 piece last year, you’ll be well aware that I am a fan of peaty and smoky whiskies. So for me, Talisker 10 was the real gem in that box. But if you’re brand new to whisky, still finding your personal taste, I’d take it easy with this one. Don’t write it off too soon. Let your palate and senses adjust to the other whiskies first. Smoky whiskies may not be your bag, and that's OK too. But trust me, sit tight on this one, and come back to it at a later date; it could well be worth the wait. The only improvement I wish I’d seen is at least one more single malt example, non-smoky, just to add that extra comparison to the mix, you know? Especially given that, as my mates at Scotchwhisky.com tell me, single malts are flying at the moment. But there you have it, a short and sweet round-up of my first International Scotch Day. And it was everything Scotch whisky is supposed be: educational, inclusive, social and filled with some seriously wicked whiskies.